To secure a seven night booking we require a non-refundable deposit of £150 at time of booking & the remaining balance would be due for payment eight weeks prior to the commencement of your holiday. 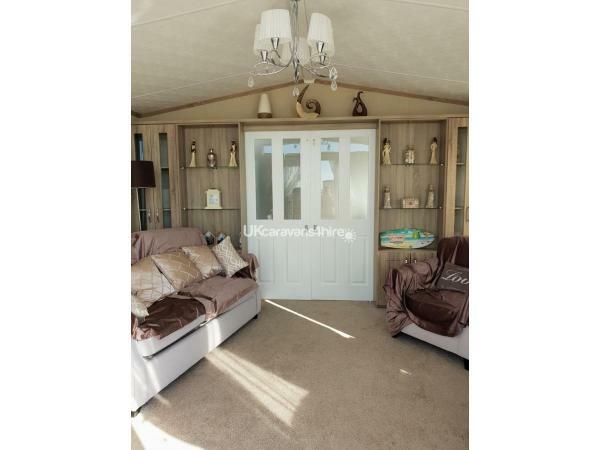 We also require a damage bond of £100 payable 1 week prior to your holiday start date to cover any damage, loss of keys or extra cleaning required due to the caravan being left in a poor state on day of departure. 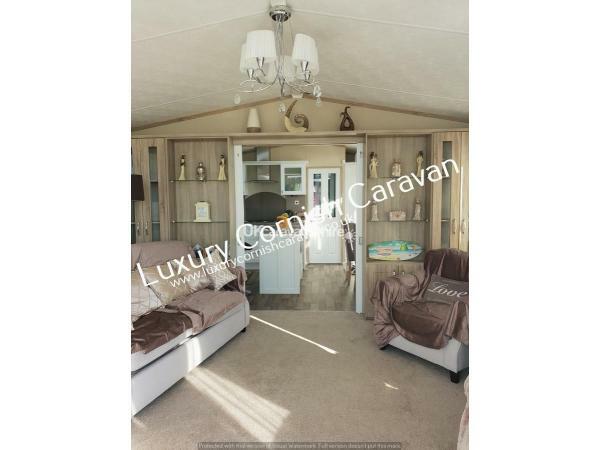 However, this is fully or partially refundable once our cleaner has inspected the caravan and provided us with a report. We operate a late cancellation policy; details of this will be sent to you along with terms & conditions once you have paid your deposit. We also offer three and four night breaks in low season; if you are interested in booking one of these options then for three nights we require a non-refundable deposit of £60 & for four nights we require a non-refundable deposit of £80. The remaining balance would be due for payment eight weeks prior to the commencement of the holiday. If you would like to make use of the swimming pools, clubhouse, leisure and entertainment facilities at Perran Sands then you will need to purchase Funworks passes. These can be arranged at the time of booking your holiday through us. Please note the prices of Funworks passes are set by Haven so please ask for details as they are not included in the price quoted for the hire of the caravan. However, if you don’t wish to make use of the facilities then it will not be necessary to purchase Funworks passes. 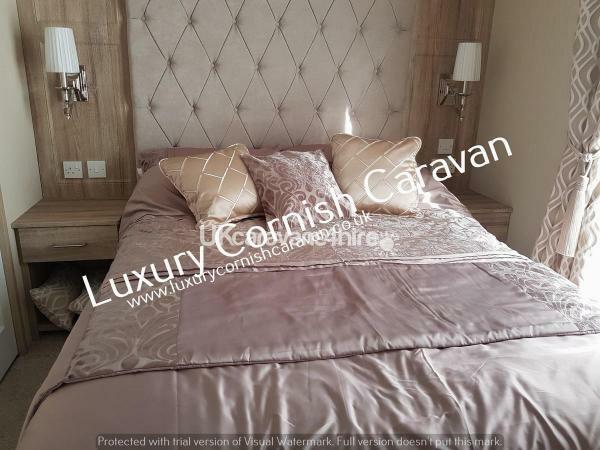 The caravan has 3 bedrooms, 1 double and 2 twin bedrooms. There is also a pull-out double bed settee in the lounge. We also provide a travel cot if required. 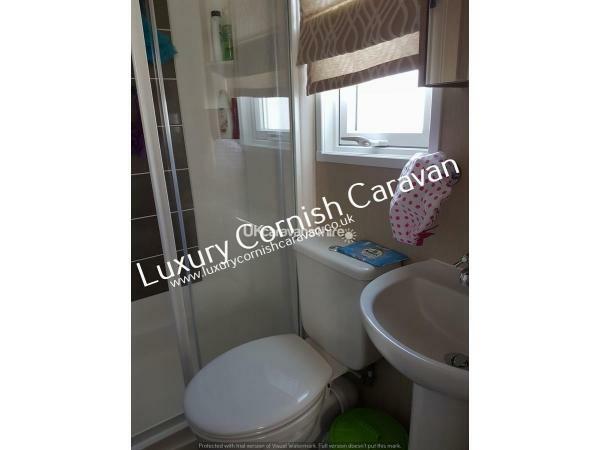 There is a decent sized family bathroom which includes bath with shower over, toilet & wash hand basin, heated towel rail & extractor fan. 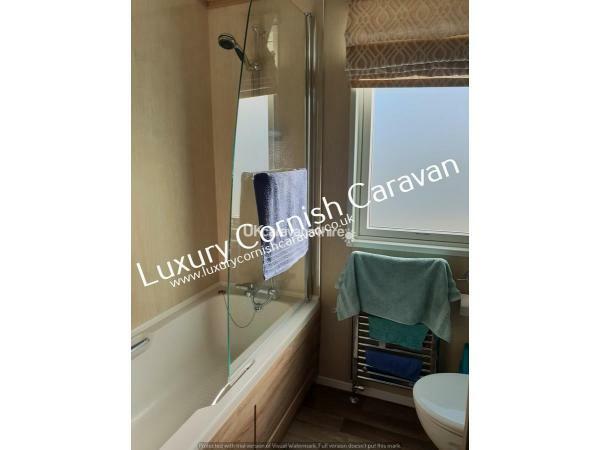 We also have an en-suite shower room to the master bedroom with toilet, wash hand basin & heated towel rail. 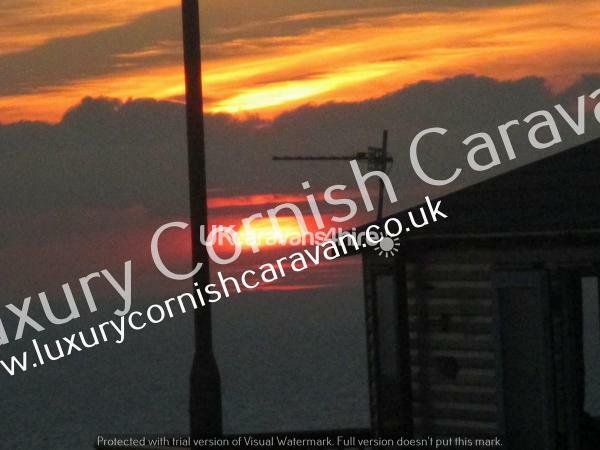 The caravan has partial sea views, a 40 inch TV/DVD Combi, fireplace with classic flame effect electric fire, an integrated microwave, fridge/freezer, folding bar stools (for use at the kitchen island if required), iron, ironing board and hoover. In the master bedroom there is a further TV with a built in DVD player and a hairdryer. There are sliding doors between the lounge and the kitchen diner which can be closed for privacy. 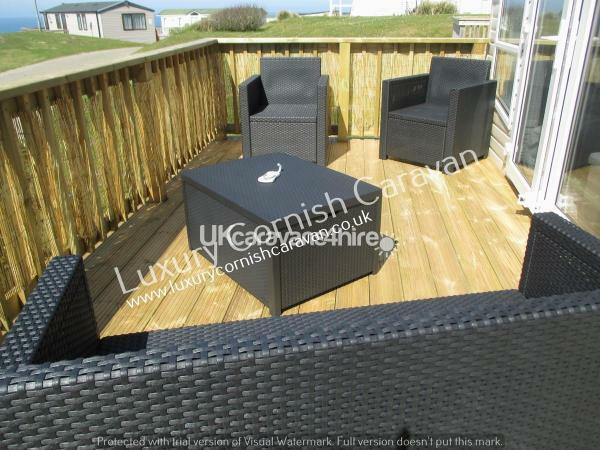 Outside the caravan there is a grassy area with patio & an 8 seater round wooden picnic table. There is also space for 2-3 cars to park beside the caravan. We have a ramp leading to gated decking with rattan furniture. 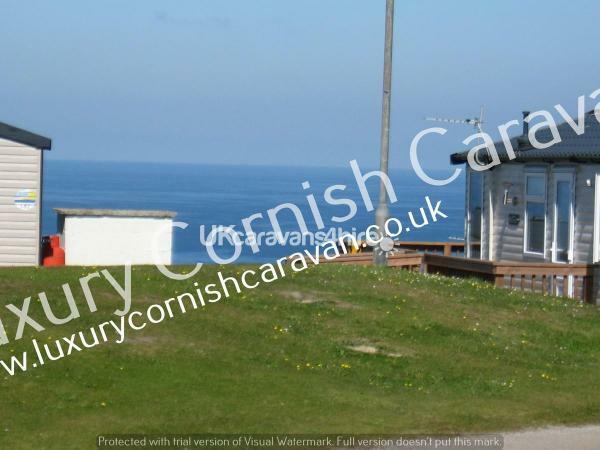 Our caravan is in an ideal position: it is approximately a 3 minute walk from the front of the caravan to the path that leads to the beach & the same from the rear of the caravan to the Funworks Complex & Restaurants. On site you will find 2 restaurants (Surfbay and Funky Fish), Papa John's Pizza, Cook's Fish and Chip takeaway, 3 bars, a convenience store and gift shop. There is also an indoor swimming pool with flume, 2 small children's pools, an outdoor lazy river with bubble pool, all-weather sports court, crazy golf, roller disco, gym, amusements and club house. The site caters for all ages with a wide variety of entertainment and activities, so there is no reason to leave the site. However, if you do you will be surrounded by beautiful beaches and many wonderful places and attractions to visit. 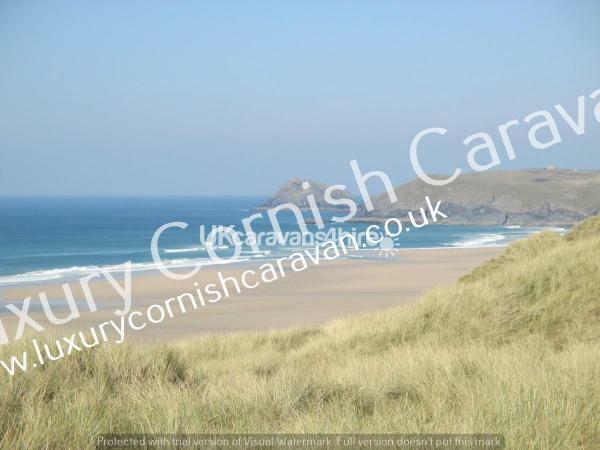 Perran Sands is located on the North West Coast of Cornwall, between the glorious golden sands of Perranporth and the big waves at nearby Newquay (6 miles/15 minutes). Perran Sands offers an idyllic seaside setting in a prime holiday location. The park has its own private beach; however access can be difficult for people with impaired mobility.